If you've seen my salted caramel chocolate cake, you'd know that I love being able to customize my cakes, so I've combined many recipes and adapted them to my taste. The inspiration/base recipe for the cake is adapted from www.browneyedbaker.com's for a naked s'mores layer cake to create this cake. Like the Momofuku milk bar cakes, this recipe has a cake soak and an intricate mix of textures in the layering, with a rich chocolate fudge sauce, marshmallow frosting, and graham cracker crumbles. 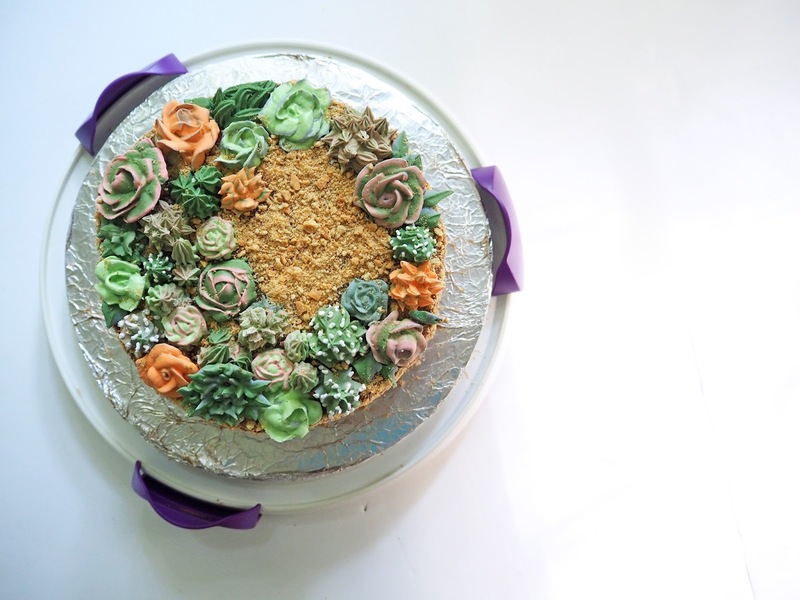 However, since I didn't want to have to buy the acetate strips for making a clean naked layer cake and I wanted an excuse to decorate a cake, I turned the naked layer cake into a s'mores layer cake decorated with chocolate frosting and royal icing succulents. To simplify the original s'mores layer cake recipe, I substituted the cake recipe for a simpler one from food.com. 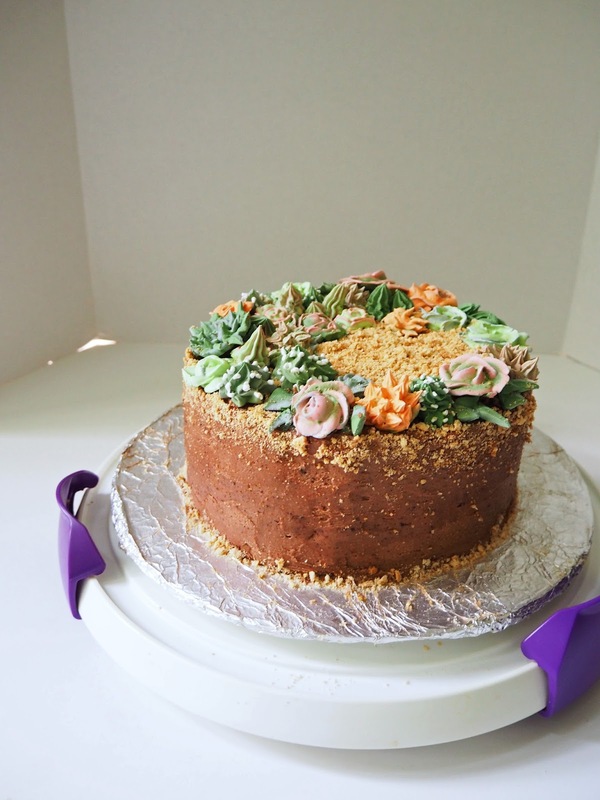 The whipped chocolate buttercream that the cake is covered in is from Chef in Training. In a saucepan, combine the corn syrup, sugar, and heavy cream. Bring the mixture to a boil while stirring. Once the liquid mixture has come to a boil, pour it into the bowl of dry ingredients (with the chocolate, cocoa powder, and salt), and allow it to sit for a minute, or enough for the chocolate to melt. Whisk the mixture until it is smooth and thick. This will probably take about 5 minutes. Add the all the ingredients: the cake mix: pudding mix, sour cream, water, vegetable oil, and eggs, into a bowl. Cut two 7-inch cake rounds from the rectangular sheet of cake. and then use the remaining scraps of cake to cut out 2 half cake rounds to make a full one, leaving you with 3 layers. Make the graham cracker crumbs. Stir together all the dry ingredients -- the graham cracker crumbs, milk powder, sugar, and salt -- in a medium bowl. In a small bowl, whisk together the butter and heavy cream until it becomes thick, then pour over the dry ingredients in the medium bowl. Using a fork, mix around the wet and dry ingredients until it forms graham cracker clusters. Line a baking sheet with aluminum foil and spray it with non-stick cooking spray. Place the marshmallows out on the pan. Put the pan of marshmallows onto the lowest rack of the oven, and broil them until golden brown on top. Once the oven was heated, it only took my marshmallows about 2 minutes per side to brown for me, so keep an eye on them. Beat the butter and powdered sugar on low speed until well blended. Add the vanilla extract and then increase the speed to medium-high, mix until smooth. Add the marshmallow fluff and toasted marshmallows, mixing on low speed until smooth and well blended. Whisk together the vanilla extract and milk in a small bowl. Layer 1, the bottom: Place one of the full cake rounds onto a cake board. Using a pastry brush, brush the cake soak onto the cake round. Spread ¼ of the marshmallow frosting onto the cake. Spread half of the fudge sauce on top of the marshmallow frosting. Sprinkle ½ of the graham cracker crumble (probably less than ½, just until covered) onto the cake. Add another layer of marshmallow frosting, ¼ of the total mixture. Layer 2, the middle: Place the cake round made of 2 halves to make the second layer of cake on top. Layer 3: the top: Place the nicest looking cake round on top and put on the rest of the cake soak. Make the whipped chocolate buttercream. In a medium bowl, combine all the ingredients: the butter, powdered sugar, cocoa powder, vanilla extract, cream or milk, and salt, with an electric mixer or stand mixer with a wire whip attachment. Beat for roughly 5-7 minutes or until it becomes light and fluffy. Feel free to add more powdered sugar or more cream/milk, depending on the thickness that you desire of your buttercream. Add more powdered sugar for a thicker buttercream and add more cream/milk for a thinner buttercream. You may also add more cocoa powder, if you favor a richer and more bitter chocolate taste. Frost the entire cake with the whipped chocolate buttercream. 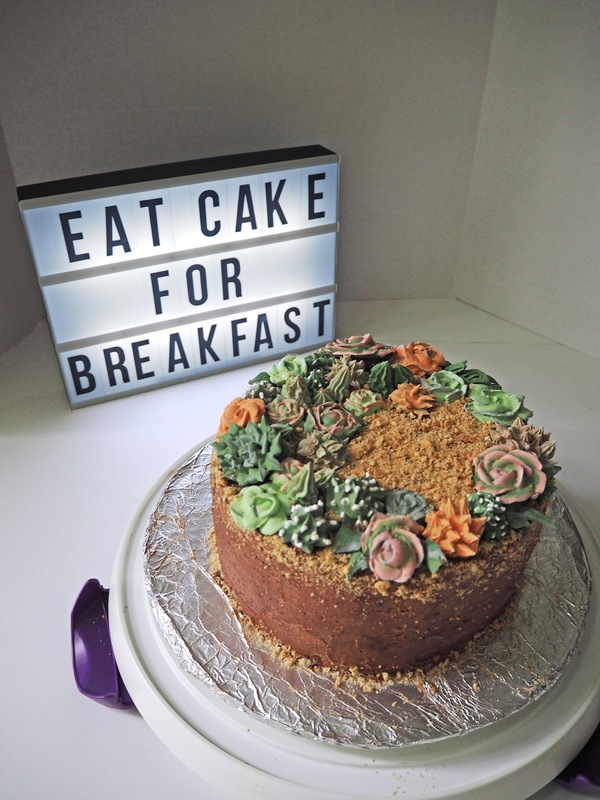 You can decorate your cake however you want, but I love decorating cakes, so I got fancy and went for some royal icing succulents. They can also be made with buttercream, but I prefer using royal icing. In addition, I crushed up more graham crackers to make for the sand, which perfectly ties in with the succulent theme and with the s'mores theme. Here are instructions for piping succulents, but I didn't really stick to any tutorial and just kind of improvised. If you make this cake, let me know, but otherwise you can just enjoy the pictures and dream about eating your own s'mores cake.